A synergystic blend of herbs to support the adrenal glands. 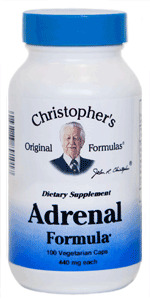 The adrenal glands are the most important organ for handling negative effects of stress. Whether it be emotional, mental or physical, including fatigue & muscular weakness. The all natural ingredients in the Adrenal Formula may aid the body's ability to regulate stress & support normal adrenal function. Great supplement for stressful or active lifestyles. Also available in Powder (Adrenetone) Form.